Knowledge is the power to discern, define, and describe. "it is existence and reality that one wishes to comprehend." 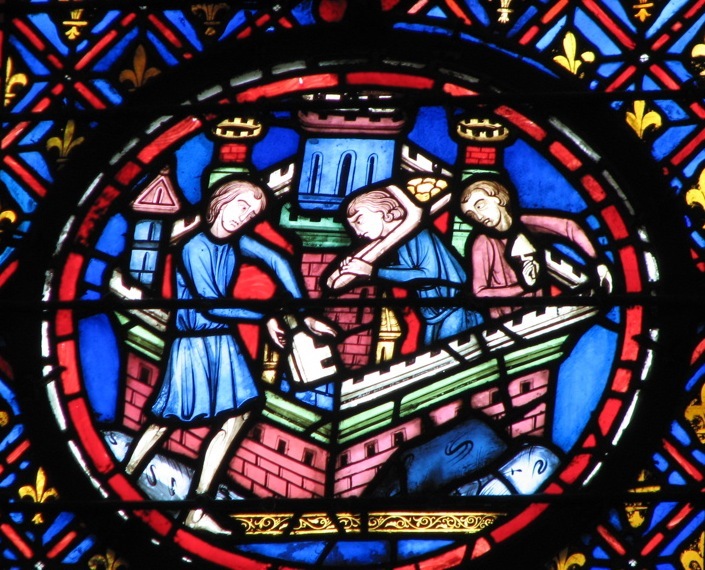 Building the tower of Babel, stain glass, Paris France. what ought we to do with what we know? "The lights of nature and of mind entwine within the eye and call forth vision. 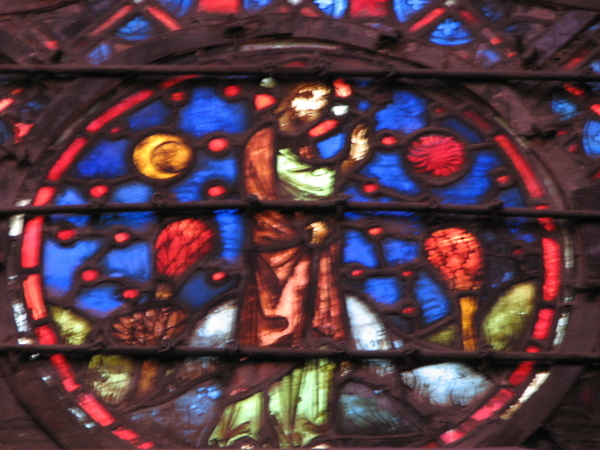 Yet separately, each light is mysterious and dark. Even the brightest light can escape our sight." Catching the Light," by Arthur Zajonc, published by Bantam Books, 1993. The power to discern certainly and distinguish degrees of certitude from the sea of uncertainty we inhabit is of primary concern when learning. Although language is used to reveal how well people discern fact from fiction, there are some findings that are surprising concepts because they have far less substance than you might imagine. While stories such as the Tower of Babel are seen as fictions that explain real differences among cultures, there is a prevailing tension between ideas about the consistence of reality and the facts of actual existence. 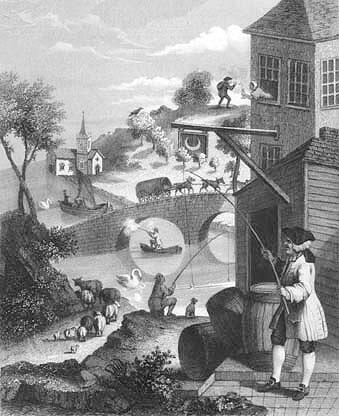 How do you distinguish between the real and the imagined? Two cartoons both reveal something, but what do they suggest to us about the way the world behaves when we are not observant? AS PART OF WHAT I CALL "PROJECT EUREKA," A FRIEND AND I HAVE designed and constructed a science exhibit in which one views a region of space filled with light. It is a simple but startling demonstration that uses only a carefully fabricated box and a projector whose light shines directly into it. We have taken special care to ensure that light does not illuminate any interior objects or surfaces in the box. Within the box, there is only pure light and lots of it. The question is: What does one see? How does light look when left entirely to itself? Approaching the exhibit, I turn on the projector, whose bulb and lenses can be seen through a Plexiglas panel. The projector sends a brilliant light through optical elements into the box beside it. Moving over to a view port, I look into the box and at the light within. What do I see? Absolute darkness! I see nothing but the blackness of empty space. On the outside of the box is a handle connected to a wand that can move into and out of the box's interior. When I pull the handle, the wand flashes through the dark space before me, and I see it brilliantly lit on one side. The space clearly is not empty but filled with light. Without an object on which the light can fall, one sees only darkness. Light itself is always invisible. We see only things, only objects, not light. TWO LIGHTS BRIGHTEN OUR WORLD. ONE IS PROVIDED BY THE SUN, but another answers to it – the light of the eye. Only through their entwining do we see; lacking either, we are blind. Arthur Zajonc, Catching the Light. Bantam Books, 1993. pp. 2-3. Do we need both imagination and existence in order to generate ideas, test concepts, and discern actual conditions of experience? Language, myth, and symbols all possess meaning; all involve and convey images. Images are among the earliest human representations. 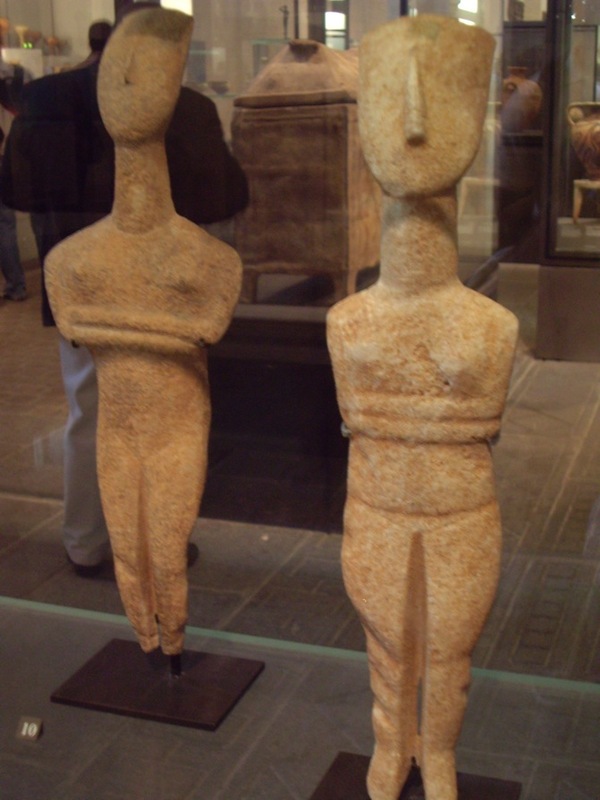 Two females; sculptures from Crete [2700 BCE] & 2000 years later the ancient temple of the Vestal Virgins in Rome. When interpreting representations, ideology, metaphors, art, and similes, the image is best tied to the actual substance to reveal an accurate meaning. 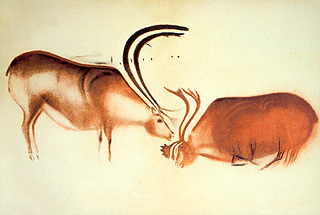 18000 - 16000 year old cave painting from the Font de Gaume in Southern France. Without some means of inquiry, or method of analysis, we are unable to distinguish the real from the fantasy, the actual from the merely formal. In example a mirage an observer senses that image which embodies the appearance or form of water, but not the substance of that liquid material. This confusion enabled by our sensory apprehension of our surroundings can become a form of idolatry if not checked by reason, or some other test of veracity. Confusing the symbolic imagery with the reality is a widespread form of human hubris – growing unchecked from bias – to which we are all subject. A method is the application of a precise process – or a test of sorts – in order to distinguish between the real and imagined events. The process involves a means to verify and a protocol to follow in documenting evidence for the certainty of what we know based on evidence. Though each part looks to be of proper scale, the entirety of the drawing reveals a false perspective. Because the distinction between the actual and the imagined is of such importance there are other pages on this web site dedicated to understanding how to approach this crucial divergence in perspectives.